Immerse yourself in the beauty of Germany and Austria! Begin your 9-day exploration in Munich and spend a day touring the fairytale Neuschwanstain Castle. Then enjoy the Alps in Austria's Innsbruck and continue your trip to one of the most charming towns in Europe - Salzburg. As a grand finale discover the top attractions of Vienna, the European capital of music, and visit St. Stephen’s Cathedral and the Schonbrunn Palace. Welcome to Munich! Upon arrival you meet your driver at the arrivals hall and head for your centrally-located hotel for check in. After the tour, the rest of the day is at your own leisure. Experience a truly royal day tour of the majestic Neuschwanstein Castle, which inspired Walt Disney! Together with your guide-driver, you are able to enjoy a hassle-free day without queuing and rushing. In the morning you check out, walk to the station and take a high-speed train from Munich through the spectacular mountains to Innsbruck. Upon arrival, you meet your driver and head for your hotel to check in. Later you meet your guide in the hotel lobby and start a tour of magnificent Innsbruck, also known as the Capital of the Alps. You explore the oldest part of the town called Altstadt, with its beautifully cobbled streets and medieval houses coloured in lively pastel colors. Amazing mix of Gothic and Baroque styles gives Innsbruck's old town a special charm. During the tour you see one of the Innsbruck highlights - the Goldenes Dachl (the Golden Roof) nicely decorated with fire-gilded copper tiles. It was constructed in 1500 for Emperor Maximilian to mark his wedding to Bianca Maria Sforza. You continue to Innsbruck's Boulevard and central street area called Maria-Theresien-Strasse, which offers a wonderful street view with the mountains seen in the back, before you finally return back to your hotel. The rest of the day is at leisure. After breakfast you check out from your hotel, and your driver takes you to the train station for a direct train to Salzburg. Upon arrival, you walk to your centrally located hotel for check-in. Later you meet your private guide and embark on a exciting tour of Salzburg and the Lake Region. You discover the UNESCO-listed Historic Centre of the City of Salzburg with its medieval fortress, baroque palaces and churches. You see the Getreidegasse and Mozart’s birthplace, pass by the Festival Houses where the Salzburg Festival is held every year, stroll along the narrow streets and enjoy the flair of this old city. 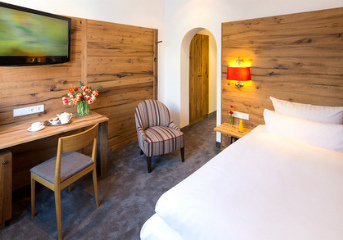 After the tour you return back to your hotel or continue exploring Salzburg on your own. Today after breakfast you check out from your hotel and walk to the railway station for your train to Vienna (1st class train tickets are included). In about 2 hours you arrive in the European capital of music. Your private driver picks you up at the station and transfers to the hotel in the very heart of Vienna. Following breakfast at the hotel, your guide takes you on a 3-hour walking tour of downtown Vienna. You start at the State Opera House and walk through the Karntnerstrasse, a shopping street in the pedestrian zone in the city center, to St. Stephen’s Cathedral. Then walk along the Graben und the Kohlmarkt, a very exquisite shopping area, to the Imperial Palace Hofburg, the former winter residence of the Habsburgs. It now houses the Imperial Apartments, Sisi Museum, Imperial Silver Chamber, Austrian National Library and much more. Continue to Ring avenue home to the Museums of Fine Art and National History, the Parliament, the City Hall and the Burgtheater. During the tour you also see Neuer Markt and the Capuchin monastery. After the tour you return to your hotel and have the rest of the day free. In the evening you can enjoy optional concert 'Sounds of Vienna'. Note: you may extend your staying in Vienna and have optional day-tour to Wachau Valley & Wine Tasting or continue your trip to Krakow. Please, contact your travel specialist for the details.